When your furry friend is hurting, you want to make it better. We do too. All Creatures is pleased to offer many medical services to our patients. We serve canine and feline patients as well as pocket pets such as hamsters, rabbits, guinea pigs, and ferrets. All Creatures is also pleased to offer cold laser therapy. This new treatment option can be used to provide pain relief from inflammatory conditions such as arthritis or for treatment of wounds. Laser treatment can often lessen or eliminate the need for pain medication. 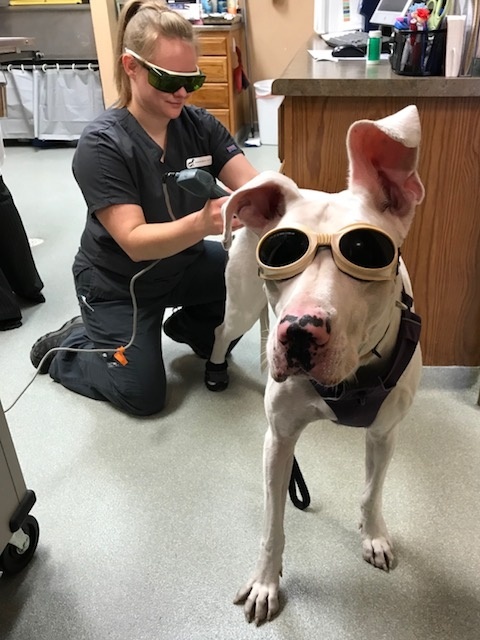 Our doctors can help you decide if laser therapy may be beneficial to your pet. We also can provide veterinary services while your pet boards with us, or while here for grooming services. We can also arrange drop off appointments for your pet, in which you can leave your pet in our care in the morning, and pick up later in the day. Emergency care is offered during regular business hours. After hour emergencies are referred to the University of Missouri Emergency Room—573-882-4589.